If you are getting ready to throw an amazing Dinosaur Birthday Party then you will need to start with some great Dinosaur party invitations. 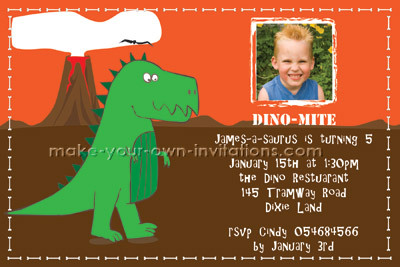 Whether you choose to buy or make your own invitations we can offer you some cool Dino invite ideas from other DIY party moms and dads who have celebrated a birthday Dino style with their own children. Look for cheap dinosaur stamps on sale at your local craft store or the craft section in your department store (Michaels, Martha Stewart, k-mart etc) Stamping is a great way to embellish your cards. 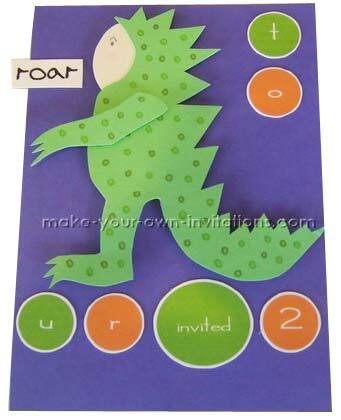 A triceratops is a great shape to use for an invitation in the shape of a dinosaur. A volcano will give you a nice uniform shape as it is a simple triangle with the top cut off. Create your party details insert with a word processing program on your computer, print them out and slip glue into the inside of your card. You will be able to find a lot of free dinosaur clipart that you can use for personal use. Make a Word document with your wording and insert your clipart image. Print our at home or at a copy shop. Think outside the square when wording your invites. Throw in a some Dinosaur lingo to keep with the theme. Try using a combo of the following wording ideas to create the perfect text for your invite. Enormous fun to be had by all' We hope youll come, it will be a Roar! Here is a list of fun Dinosaur Fonts that you can download and use free for your own personal use. Dinosaur Beach by Mark Carter A nice bold, chunky font (uppercas and numbers only) I like it for headers and main titles. - oh no, it looks like this font is not available anymore. If anyone is able to find it please let me know! Dinosaur Jr (da font) - I like this font for text as well as headers. Dinosaur Skin - (fontspace) - i guess this is supposed to look like dino skin... you decide. Dingbat fonts - fonts with images - I love using these fonts instead of clipart as you can enlarge them without losing quality. For the parent who does not have the time to create their own party invites we have some printable invitations that you may like to take advantage of. The first is a freebie and the second invite is available from our custom invitation shop. Print off this freebie cute as a button triceratops birthday invitation with your color printer and fill out the party details. You can also use it for kids graduation partys and other celabrations. We have a couple of step by step tutorials for you to try. Check back for more invitaitons. These dinosaur birthday invitations were made for my little boys party. I actually make quite a lot of invitations, particularly for children's birthday parties. I hope they inspire you to create your own hand made invitations for your next party. I drew the dinosaur design myself, it was loosely based on Max in the book 'Where the Wild Things Are', which my son was reading at the time. The body and arm of the dinosaur are two separate pieces. 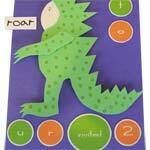 I used patterned green paper to make the dinosaur costume shape, then cut out an oval of pale peach card and glued it behind for the face. I just drew on the eye and the blush of the cheeks I made with colored pencil. Inside was the information for the party like: 'U R Invited to....'; When; Where; RSVP. I printed these titles out in a 'monsterish' font then just hand wrote in the details.